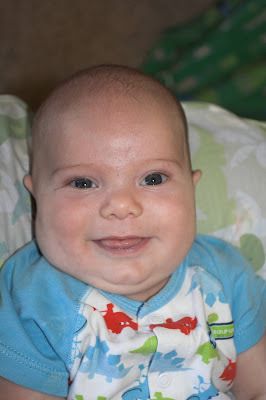 Jack has been smiling and cooing and growing and wrapping us all around his little fat fingers. He went for a check up Friday. 15 pounds, 24 1/2 inches long at 11 weeks old! That's some serious growing!!! 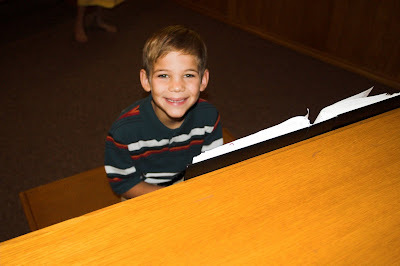 Jonathan played special music for the first time Sunday. Amazing Grace on the piano. He did such a great job. I was literally bursting with pride and joy! He is reading his first Junie B. Jones book (by himself anyway). Hi. I have been praying for people. Then he drew a picture of himself with our president for me to mail. It's too sincere not to mail. I hope it touches whoever reads it, because it sure touched me today.